Leonhard Jones is Alexandria Jones’s younger brother. He enjoys woodworking, and he cut a wooden cube into 8 smaller blocks to make himself a puzzle. Leon painted the 8 blocks with his two favorite colors: red and forest green. When he was finished, Leon could put the blocks together into a red cube, or he could switch them around to make a green cube. How did Leon paint his blocks? Alex liked Leon’s new block puzzle so much that she wanted him to make a similar puzzle for her. Alex nibbled on her lip and stared at the ceiling — her thinking expression. “Okay, then,” said Leon. “We need enough squares of each color to cover the surface of the cube. 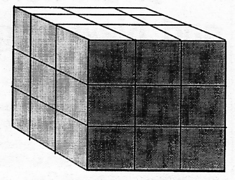 That’s 9 squares per side times 6 sides — 54 squares. So we have to paint 54 squares teal, 54 purple, and 54 yellow. Alex followed her brother out to the tool bench, with her trusty dog Ramus bounding along behind. But when the children started poking around the woodpile, Rammy decided to run out to the backyard and chase a few squirrels. They found the block of wood. It was the end of an old 4×4, and it made a nearly perfect cube. Do you know the answer to Leon’s question? They spent the rest of the afternoon measuring, cutting, and sanding the blocks. Alex biked in to the paint store and bought three small cans of latex paint. After dinner, they spread newspaper on the table, but then they had to leave for a homeschool group meeting. Finally, the next morning, they got their brushes out and filled an old butter dish with water. Alex and Leon were ready to paint. Then Leon hid his face in his hands and groaned. 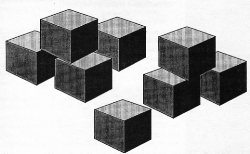 Is it possible to paint 27 small cubes so that they can be arranged into a larger cube 3 different ways, each time with a different color covering the outside? This is a great problem! Can you tell me more about the copyright on these stories and whether it’s possible to get permission to use them for educational purposes? You can use anything on the blog in your own classroom or homeschool, as long as you aren’t trying to pass it off as your own creation. Not that you have to say my name every time use a game or mention one of these problems with your students, but if you print them to hand out, I would appreciate a small notice at the bottom of the page giving my blog’s address. You can find a more thorough copyright statement near the bottom of my About page. If you wanted to use these stories beyond a classroom (in something you are writing or selling), then you would need to email me to discuss it. This puzzles are great. Good exercise for my students. Thanks for sharing, and yeah I will not forget to mention your name.